Rear Subframe Bushing Set, Poly 75D for BMW E46 (323, 325, 328, 330, M3), Z4. The stock rubber subframe bushings deflect as torque moves through the drivetrain, which allows the entire rear end to move. Upgrading your stock subframe bushings to our poly 75D subframe bushings will eliminate virtually all subframe movement for increased power transfer to the rear wheels. It is also the first step in maintaining proper rear-end geometry and alignment. 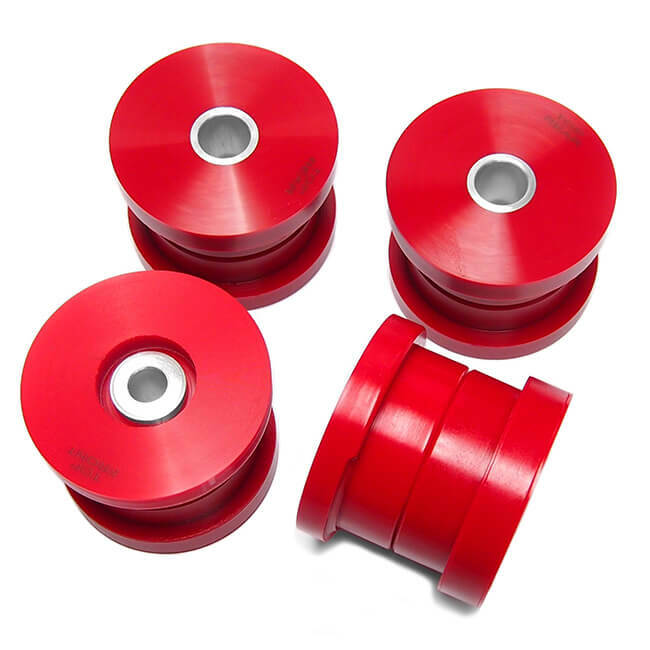 The material used for the subframe bushing location(s) must match the material used for the diff mount bushing(s). Our U.S. Military Spec 75D durometer compound is as hard as a bowling ball, yet has elasticity and memory. This exclusive compound allows us to manufacture a bushing that has virtually the same performance as a solid bushing without the harshness on the chassis associated with solid metal bushings. Likewise, its elasticity and memory means they are also free from deformation which plastic bushings (Delrin, UHMW) are very prone to. Made of our exclusive U.S. Military Spec polyurethane (75D hardness) with aluminum sleeves. Engineered for a perfect fit. Set of four subframe bushings. Read why our polyurethane bushings are the highest quality bushings available. Original AKG design. Learn more about Genuine AKG Parts here. Our performance parts are proudly made in Illinois, USA and used in over 60 countries worldwide. © 2019 AKG Motorworks, Inc. All Rights Reserved.